This October, we’ll be bringing the Ignite conference to Europe for the first time. Full of technical sessions, hands-on workshops and expert speakers, here are three reasons why you should make your way to Amsterdam this October. Ignite Europe is a fantastic opportunity to expand your international network, with more than 1,500 security experts in attendance and plenty of workshops and sessions in which to connect. Ignite Europe is not only a security conference for the future, it is also a place where cybersecurity leaders and professionals can get together to discuss and share their experiences on how to implement and handle external influencers, such as GDPR. We will be featuring over 100 sessions, covering everything from cloud and threat prevention to endpoint security, threat research and compliance. You can start creating your schedule today with our session builder. You will also have a chance to prove your skills and join an elite group of skilled professionals by taking the Palo Alto Networks Certified Network Security Engineer and/or System Engineer accreditation exams. Secure your seat here. Cyber Range sessions provide the latest interactive training – using actual threats – to keep your teams razor-sharp. Equal parts cross-disciplinary training tool, video game and highly immersive team-building experience, Cyber Range is an exciting and fun way to effectively train you and your front-line people. Plus, if you register for Ignite Europe by 31 August, you’ll receive a ticket discount and a complimentary welcome kit* featuring unique items that represent Dutch culture. We hope you can join us this October in Amsterdam. * Refer to program rules. 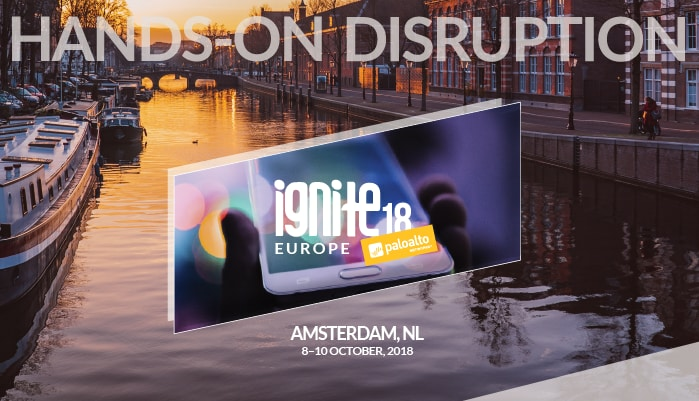 The post Three Reasons to Attend Ignite Europe This October appeared first on Palo Alto Networks Blog. Sit back, relax and enjoy this week’s Channel Scoop. New Opportunities: 2019 Channel Partner Trends. Predicting what the year holds is hardly a science, not even one that artificial intelligence can foresee. However, when we listen to our customers, listen to our partner community, and observe shifting business dynamics, we can anticipate where the market is going and, more importantly, how our partners can maximize their success with us.